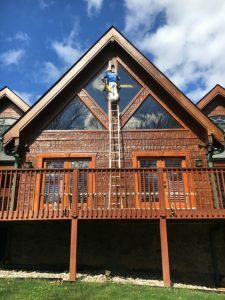 Mr. Windows Cleaning Service, LLC specializes in residential and commercial window cleaning and power washing services in the Northern Virginia, Maryland and Washington Metropolitan area. We are owner operated with over a decade of experience and 1000’s of satisfied customers. Click here to see what many of our valued clients have to say. Contact us today to discuss your personalized cleaning solution in cities such as Reston, Manassas, Arlington, Springfield, Herndon & Gainesville, Virginia, Chevy Chase, Maryland and Washington, D.C. PLEASE NOTE: We No Longer Do Storm Windows! Our specialty at Mr. Windows Cleaning Service, LLC is in giving you perfectly clean windows (even the hard to reach ones) and we are ready and able to serve your home or business today. Our professional window cleaners are trained to provide the superior customer service you expect, whether in the quiet environment of your home or the hustle and bustle of your busy workplace. We offer an extensive list of exterior cleaning and sealing services for both Residential and Commercial Clients. Our homeowners love the fact that we will clean something as small as their back patio or pool deck, and our commercial clients enjoy knowing that no matter how large their cleaning project, we have the training, experience and equipment to not only meet their needs, but perform a high quality job in a timely manner. One of the specialty services that deserve special mention is our Gutter Cleaning & Whitening Service. Our goal in cleaning your gutters is to give you peace of mind knowing that your gutters are 100% clear and free flowing. And if you have noticed a discoloration or black lines starting to form in your gutters, our Gutter Whitening service can make them look like new again and take your curb appeal to the next level! We are a locally family owner operated, professional Cleaning Company that is licensed, insured and SWAM certified. Our owner, Mike McLaughlin holds a Department of Criminal Justice Services (DCJS) security background check (which he carries at all times) so you know we can be trusted in your home! Contact us today to discuss your next cleaning project. Window cleaning can be a dangerous and time consuming job but we have a solution to all of your window cleaning needs – even the hard to reach ones! The window cleaning team at Mr. Windows Cleaning Service LLC can handle any size or type of property safely and efficiently. Our Window & Glass Cleaning services include but are not limited to; Windows, Glass, Mirrors, Skylights, Light Fixtures, Chandeliers, Storefronts etc. Driveways, walkways, siding, and decks accumulate build-up from many sources prevalent in the Washington Metropolitan Area. Seasonal pressure washing helps protect the outside of your home and business and can also reduce weeds, stains and dirt in cracks and crevices. Our pressure washing (aka power washing) of driveways, sidewalks, patios, concrete, pool decks, basement stairwells, exterior walls and siding is a great way to increase curb appeal and have the exterior of your home or property looking like new again! Keep your gutters and downspouts clean and effective with gutter cleaning services from Mr. Windows Cleaning Service LLC. Taking care of your gutters increases the curb value of your home or property and saves you money by preventing costly future repairs. Having your gutters cleaned regularly is an inexpensive way to protect against damage to one of your most important investments: your home or business.